So you’ve decided to study abroad? Congratulations! You must be very excited about what’s ahead of you. Possibly a tiny bit scared, too? And confused about where to start and what to look out for in preparation for your adventure? That’s definitely how I felt when I started preparing for my year abroad at the University of Leicester in the UK. If you’ve got about a million questions about how to prepare for your studies abroad and what to do when you’re actually there you’ve come to the right place. Why? 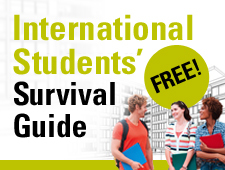 The first downloads are now available on the new International Students’ Survival Guide website – for free! These downloads are chapters from a new book with the same name. What’s this? This Guide is dedicated to help international students from all over the world who are studying, or preparing to study, in the UK, the US or Australia. It has been written by four authors who, between them, have over 60 years’ experience working with international university students in the US, UK and in Australia. How do I access it? All you need to do is sign up with your e-mail address. You’ll then be sent to a website giving you access to the International Students’ Survival Guide. At the same time you’ll receive an email with the link. We’ll then also email you whenever there’s a new chapter download available. How much does it cost? That’s the best thing about it – it’s all available completely free of charge. The first couple of chapters are available already, so sign up and start reading straight away! This entry was posted in Students on May 28, 2014 by admin.